We offer a range of covers designed to provide effective protection against extreme weather, bird droppings and basic garden grime. The covers are produced from tough woven polypropylene in green and come with reinforced eyelets and tie cords. Cost effective covering including BBQ, Patio, Furniture and Rotary Covers. Weedfabricdirect supply one of the largest ranges of tarpaulins in the UK. 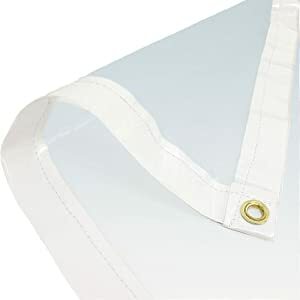 Each tarpaulin has reinforced hemmed & roped edges and we also offer a range of elastic ties and ball bungees for easy fixing. Whether its blue, green, clear or even camouflage you’ll find the size you need here. Do you require a custom sized cover? Over the years we’ve had enquiries from around the globe, each very different. From Swimming pool to yacht covers weedfabricdirect can make you any size tarpaulin. Materials are also very different and usually specified on request, so if your looking for something special please give us a call on 01382 738471 or chat below. We’ll simply need the application to advise the material and your dimensions.